My Mum's tooth started to hurt on the eve of Hari Raya. It hurt more the next morning. She went to the dentist for help. The clinic was closed. The pain got progressively worse and in the afternoon, half her face was red and swollen. She looked in bad shape. She couldn't eat and was really suffering from the throbbing ache. She went to the dentist again the next day. It was still closed. She refused to visit another dentist, as she trusted this chap whom she's been seeing for the last 20 years. I suddenly remembered a remedy which some friends have found to be effective for such cases. Open a capsule of Yung Kien Ganoderma and mix the powder thoroughly with a 10 cent glob of Greenzhi Toothgel. Then apply it onto the sore tooth. It's anti-inflammatory so it helps reduce the pain. It acts as a protective coating against the environment. The toothgel is food-grade so it's perfectly safe to swallow. My Mum did that and overnight, her swollen face went back to normal. She claimed there was no more ache. 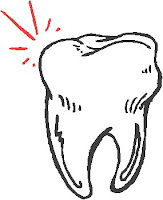 Of course, it was just an interim measure as the tooth was still a problem that needed to be taken care of. The important thing was she wasn't tormented by the continuous pulsating pain. She went to her dentist again. Still closed! I advised her to apply the Lingzhi+Toothgel mix immediately after every meal. It worked - no pain. Day 4, she visited the dentist again. The clinic was still closed. My goodness, dentists nowadays enjoy a good life. Such a long break, and he's not even a Muslim! Finally, on Day 5, he was open for business. She got it all sorted out. The Lingzhi+Toothgel mix is an excellent temporary measure. It's a simple painless solution, and can be used anywhere, anytime. You can apply the same formula for mouth ulcers, inflamed gum etc. And you can use it while traveling or when it's inconvenient to visit a dentist. Please email me at laifuiping@gmail.com to buy.